We were very fortunate to have Robert Sullivan, Professor of Trumpet at Northwestern University’s Bienen School of Music, at the Music Institute of Chicago for a masterclass last week. Three students played solo repertoire and 4 ensembles performed short works. Twelve students from ages 8-17 benefited from this fantastic opportunity. We would like to thank the Chicago Philharmonic and the Music Institute for making this possible! See program here: 4.4.17 Master Class Program and click on thumbnails below for larger images. Thank you Professor Sullivan! This entry was posted in MIC Student News, MIC Student Performances, Uncategorized on April 11, 2017 by brassforbeginners. My apologies for not keeping current with the MIC Trumpets Blog! It has been a very challenging but rewarding year, and it is time to start sharing news again about the MIC trumpet studio. I discovered when I came back to the site that a very important blog was never posted…SORRY Charlie and John!!! Charlie Clarke studied at MIC for several years and played as a member of the advanced MIC trumpet ensembles. An excellent musician, always supportive of his fellow students, Charlie always rose to the occasion and made fantastic music. Below are a few pictures and information that Charlie provided about his interests and plans when he graduated last Spring. Hope College is going great for you Charlie! Charlie started playing trumpet in 5th grade and started at MIC in 8th grade. Charlie went to New Trier High school, where he played jazz piano in Jazz Ensemble 1. Charlie also plays blues, classical, and rock piano along with jazz trumpet. Charlie has enjoyed excelling at both instruments throughout high school and plans to take his talents to University of Missouri. Although he doesn’t plan on majoring in music, he plans on playing piano and trumpet in the jazz program and trumpet in their football marching band. Along with playing music, Charlie is also very involved in sports journalism. He just finished his senior project with WGN Radio, where he wrote game recaps for the Cubs/White Sox and went into the Tribune Tower each day to work with WGN. On top of that, Charlie wrote for CSL Insider and his school newspaper. He also hosted a show on his school’s radio station and plans on working with ESPN Radio in Columbia next year. Over the summer, he’s covering Northwestern football/basketball with 247 sports, writing for baseball prospectus, and Ushering at Ravinia. John Kinne began studying trumpet in a group class at Baker Demonstration School in 4th grade and then began private study at MIC where he quickly advanced, eventually joining the advanced ensemble where he performed for numerous concerts at MIC, the Chicago Brass Festival, among others. 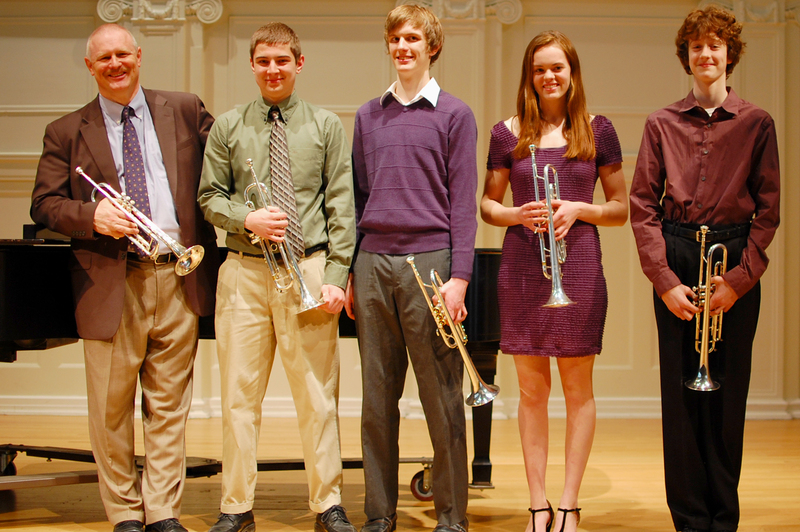 John performed for a masterclass with Boston University Professor of Trumpet Terry Everson (pictured below) and earned a music scholarship to attend Cornell College in Iowa. Without a doubt, John’s exceptional musical talents have graced the groups that he plays with in college. Enjoy some photos from the past… hope it is going great John!! This entry was posted in Uncategorized on May 19, 2016 by brassforbeginners. Neuroscientists on how music affects the brain- interesting, and fun video! This entry was posted in Music in our world on May 8, 2015 by brassforbeginners. 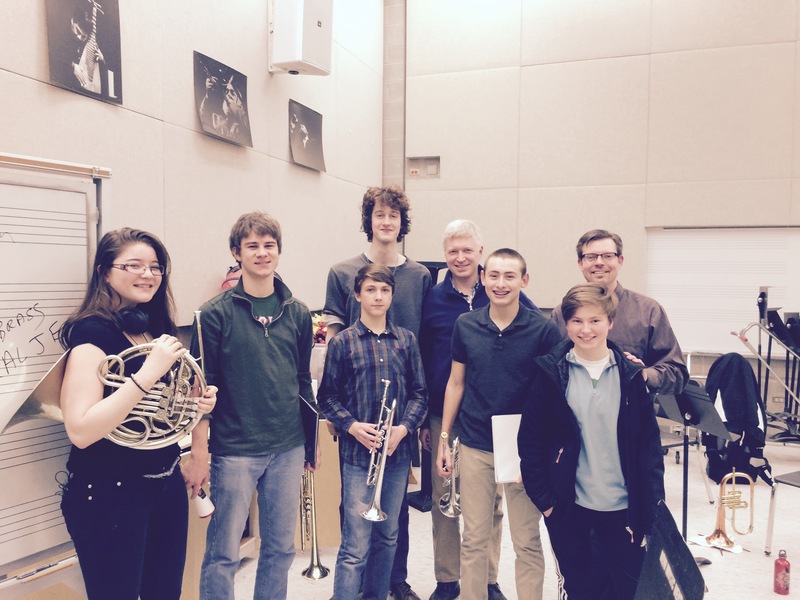 Congratulations to MIC students Charlie Clarke, Filip Czarkowski, Emily Booden, Francisco Espinoza, Imogen Eyler, Paul Hletko, John Kinne, Victoria Seliger, Daniel Vargas, and Jefferson Wenzel who participated in this year’s Chicago Brass Festival at NEIU. Brass for Beginners® students from Lincoln Elementary also gave a presentation and everyone had a great time. Click here for a post about our involvement on the MIC website. 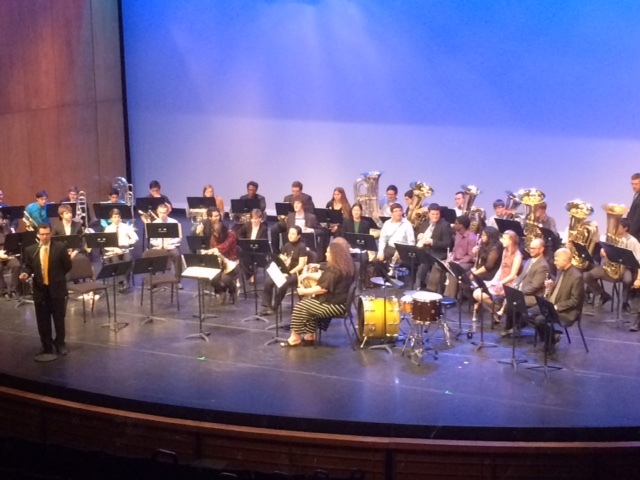 Click here to hear a snippet of the Festival Brass performance in the auditorium. Click here to see pictures posted by NEIU on facebook. Watch the advanced trumpet trio perform a fugue by Henry Purcell below. This entry was posted in Uncategorized on April 17, 2015 by brassforbeginners. 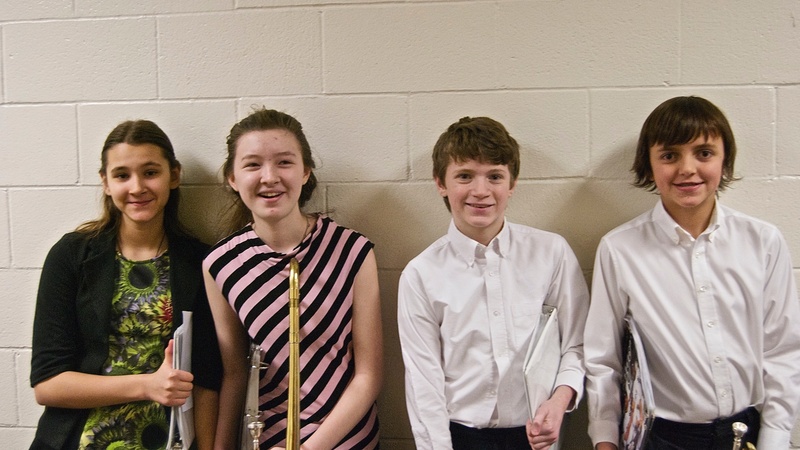 Congratulations to all MIC students who participated in the 2015 IGSMA Solo & Ensemble last Saturday at King Arts School in Evanston! A lot of hard work went into this and we are very proud of the level of playing exhibited by these young musicians. This entry was posted in Uncategorized on February 22, 2015 by brassforbeginners. I rarely receive mentions in reviews for concerts I play, so had to share this (see below). I have been playing Handel’s Messiah with the Apollo Chorus of Chicago for many years at Symphony Center and Harris Theater. 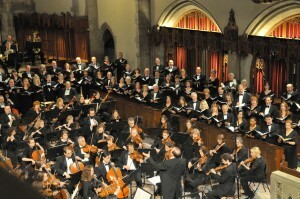 It is truly an honor to play with such a fine chorus and orchestra. Next performance is at Harris Theater (205 E. Randolph Drive) on December 20, 2014 at 3:00pm. 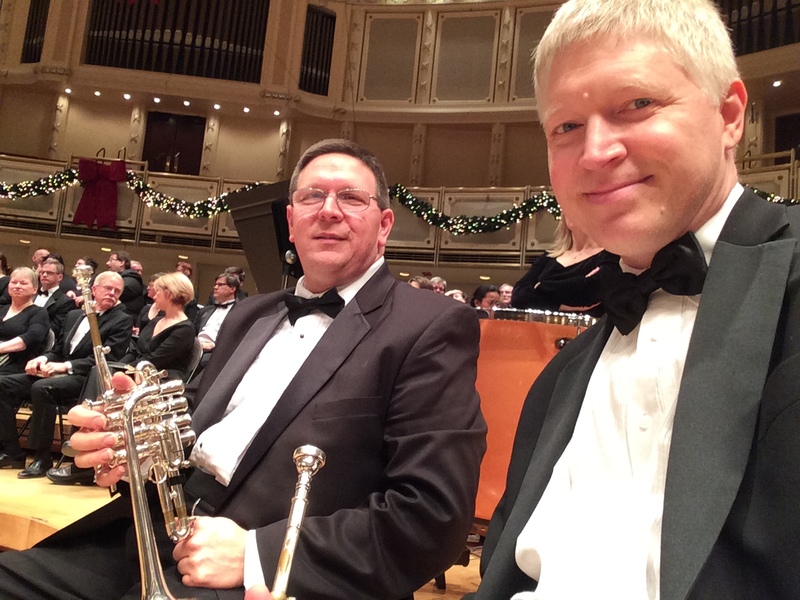 Here is a picture of me with my friend and colleague, John Burson at last Saturday’s performance at Symphony Center. Happy Holidays! Talk about a 135-year labor of love! This all-volunteer choir—founded in 1872 after the Great Chicago Fire and performing at the opening of the Auditorium Theatre in 1899 and the 1893 World’s Columbian Exhibition—must sing. Since 1879 they’ve devoted untold hours of rehearsals and performances to their signature rendition of Handel’s masterpiece, performing mostly at Orchestra Hall in Symphony Center. 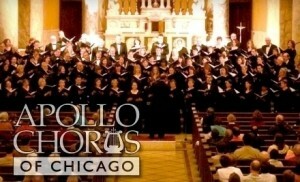 Now, along with last night’s sterling presentation, The Apollo Chorus will offerMessiah on December 20 at the Harris Theatre for Music and Dance in Millennium Park. It’s a princely and beloved tradition. And in many ways this incarnation harks back even longer—to the first charity performance in 1741. 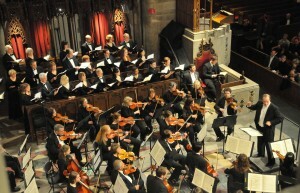 With a 28-member chamber orchestra (including a vintage harpsichord) as intimate as the original, and the 110+ chorus (the mixed voices, interestingly, not separated into sections), the performance on December 6 was as faithful as forceful. With 16 poinsettias flanking the stage, and glorious wreaths and garlands hanging above, Orchestra Hall was a festival in itself. Add to that music director Stephen Alltop’s masterly conducting and four spirited soloists, and a great work found fulfillment. Alltop brings a disciplined, confident brio with a brisk but never hurried pace to the 160-minute work—so many good tidings from 273 years ago. Dressed in black but as colorful as four voices can range, the chorus proved flawless in attack, diction, blend, precision, dynamics, and range, achieving hushed reverence and remorse in “Behold the Lamb of God” and full-throated glory in the “Hallelujah Chorus.” As for the unimprovable orchestra, the “Pastoral Symphony” never sounded so tender or “The Trumpet Shall Sound” more triumphant in its Handelian magnificence. Wonderful turns by concertmaster Jeri-Lou Zike and principal trumpet Chris Hassselbring were manna for the master. Radiant in red, Elizabeth Marshall brought a bell-like purity to her soprano solos, none more endearing than “He Shall Feed His Flock.” Beautiful in beige, J’nai Bridge’s mezzo-soprano brought out all the original excitement in “O Thou That Tellest Good Tidings to Zion.” A tenor with an unforced and constant smile, Samuel Levine was well-contrasted with David Govertsen’s magisterial bass, the voice of God by proxy. Utterly accessible, Messiah belongs to everyone with ears. But it seems strange that, since two-thirds of the text chronicles the Passion and Resurrection, that it’s not more often performed at Easter than Christmas (but, of course, not to be done in installments). In any case it’s an oratorio for all seasons and, displaying Handel’s skill at taking the best from Italy, at times it’s also an opera. Last night, the accolades of a grateful audience proved a very public payment for services rendered, a grateful acknowledgement, and—after 135 seasons—a promissory note. 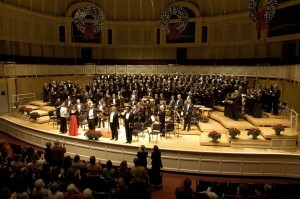 Handel’s Messiah Apollo Chorus of Chicago reviewed December 6, 2014 at Orchestra Hall at Symphony Center then plays Saturday, December 20, 2014 at 3:00 Harris Theater for Music & Dance, 205 E. Randolph Drive. This entry was posted in C. Hasselbring News on December 8, 2014 by brassforbeginners. Volume One of the Brass for Beginners™ (BFB) curriculum will soon be available in print. It is the first brass method for beginners that utilizes the natural trumpet as the primary teaching tool, and it is the first curriculum, perhaps for any instrument, that intertwines history and pedagogy, resulting in a truly interdisciplinary approach to learning. For example, the book discusses the Greek salpinx, and pedagogical activities focus on what we know about the instrument through Greek literature, iconography, secondary sources, and finally by examining the only existing complete salpinx in the world, which is held at the Museum of Fine Arts in Boston (see illustration right). In addition to its well documented use in warfare, we know that the salpinx was used for ceremonial purposes and even for entertainment. Perhaps most interestingly, playing the salpinx was an Olympic event in ancient Greece, and a very important one, because the winner announced the important events for the duration of the games and attained a very high status in Greek society. The BFB curriculum includes a lesson entitled “Trumpet Olympics,” which teaches students how to excel at different technical and musical aspects of playing the trumpet. Students sign up to compete in specific “Trumpet Olympic” events, train with the help of their coach, and then evaluate and refine their skills and performance. Another element of the Brass for Beginners™ curriculum designed to bring the history of lip-blown instruments to life for young learners is called “Trumpet Tales” which include stories, original illustrations, and accompanying sound files. 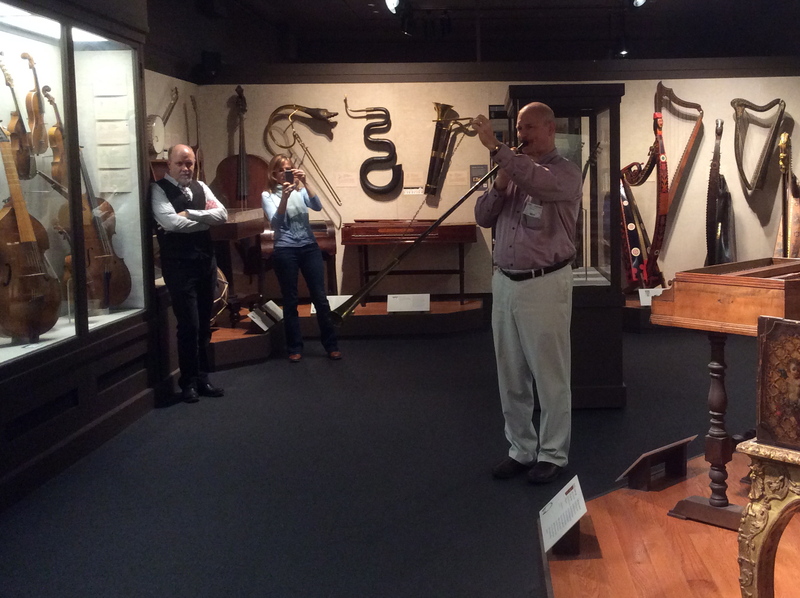 When I learned that the Museum of Fine Arts, Boston had a replica of the original salpinx that could be played, I contacted the curator of musical instruments, Darcy Kuronen, to see if we could record on it so students could hear an authentic sound of a salpinx. 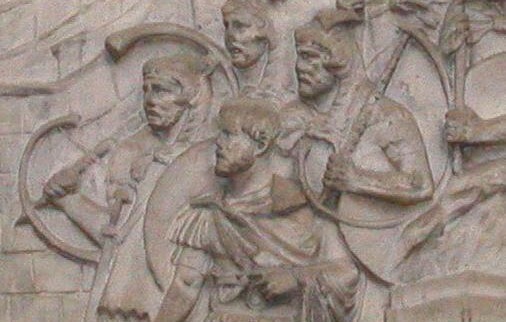 One of the best documented trumpeters of ancient Greece was Herodorus of Megara, who was able to play two salpinx at once, won ten Olympic contests, and was credited with helping achieve great military victories. If anyone fits the description of “Olympian” as a trumpeter in 2014, it would be my friend and long time colleague, Terry Everson, Associate Professor of Music at Boston University. Some of you may remember that Terry gave a master class at MIC in 2011 (see above photo). Mr. Kuronen generously offered to make the instrument available, and Terry agreed to come and record on it, so I traveled to Boston just before Thanksgiving 2014 with BFB co-author, Kirsty Montgomery. The experience was amazing for all of us, and we will have lots to share in the coming days on the Brass for Beginners™ Blogsite. We will also have a special page under the “Curriculum” page called “Salpinx Project,” where we will post more information, photos, video, and audio clips. I want to express my gratitude to Darcy Kuronen and Terry Everson for making this possible, and I am delighted that we can share this amazing experience with current and future MIC and Brass for Beginners™ students. This entry was posted in Uncategorized on December 5, 2014 by brassforbeginners.